I often wonder when punk lost its identity. With so many conflicting takes on such an accessible style of music, it’s no wonder there are thousands of internet nerds attempting to lay claim on what punk is or isn’t. It’s a genre that sparks debate and rightly so. We have logos permanently inked on our skin, we work hard to pay for our record collections and we’re willing to travel hours to catch our favourite bands perform. It’s our escape from the daily grind, and for over a quarter of a century, The Bouncing Souls have served as a constant reminder as to why I love punk music and have provided inspiration for many tattoos along the way. The Souls know full well the trials of maintaining a punk rock lifestyle. When times were at their most lean, band members found themselves living on the streets, yet cemented their DIY credentials by promoting local shows. And to this day, they refuse the luxury of buses and choose to tour the States in their own beat-up van. Their sincerity to the underground scene has never been questioned and their music is a genuine reflection of this. Since forming in 1988, the Bouncing Souls built a reputation for fast-paced, explosive punk rock. On Hopeless Romantic, the New Brunswick outfit’s fourth studio album and career highlight, the quartet vary the tempo and experiment with a more restrained style of writing. Songs like Night On Earth and Undeniable are certainly mid-paced, yet their raw and direct approach is never subject to compromise. Even the up-tempo tracks are less frantic, with the focus more on memorable hooks than unrelenting speed. Bullying the Jukebox is so catchy you might find yourself hating it – but only a little. Hopeless Romantic is a feel-good record and is something of an anomaly in the punk genre. Greg Attonito’s lyrics draw upon his own personal experiences but they could just as easily relate to any of us. The lyrics from second track ’87, ‘Do you remember the days gone past and how we always wanted the good times to last, the times we spent hanging out is how we learned what life is about…’ remain as a universal flashback of times spent with friends, words that resonate with our own memories. 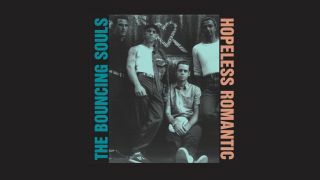 In the midst of the compact disc boom of the 90’s, The Bouncing Souls found a way of demonstrating their faith in traditional vinyl. From the record graphic printed on the disc, the track list division into sides A and B, to the familiar warm turntable crackle that bookends the 13-song collection, Hopeless Romantic is a nostalgic record that wished it came out in the heyday of punk, before the bleach ran dry and the boots became sneakers. Play it loud and think of summer.